Waterproof Canon Powershot D20 - Canon Powershot Camera released soon with the ability of waterproof, shock resistant, anti-dust and anti-freeze. Canon Powershot D20 Waterproof so it is suitable for diving as a hobby can take photos in the water as well. Canon Powershot D20 has a 28mm wide angel lens with 5x optical zoom lens coupled 12.1 million pixel CMOS sensor and DIGIC 4 image processor. No messing around Japan in technological development, Canon Powershot D20 camera that can take a dive as deep as 10 meters, but with the option of adding the WP-DC45 (waterproof case) and the addition of an external flash (flash) so that the application allows for shooting up to a depth of 40 meters. The camera also has a resistance of antifreeze up to 10 degrees celcius. 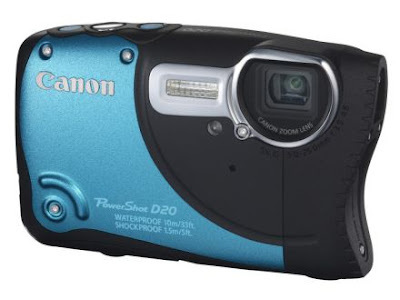 So a little review about the Canon PowerShot D20 is waterproof, shockproof and dustproof.